This multi-stemmed deciduous shrub produces a impressive display of finely cut golden foliage, as well as large plates of white blossom during early summer. Cultivation tips: Sambucus will survive in all but the poorest soils, whether chalk, clay or sand. 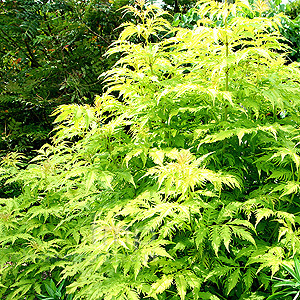 The golden or variegated forms will prefer a sheltered position in full sun where foliage will remain all the more golden. May become leggy with age and many prefer to cut back in late winter to encourage compact growth. Mulch with compost every fee years to feed.